Homeowners, has this situation ever happen to you? Eye rolling? Shaking your head? A deep sigh of frustration? Yes, these would be natural reactions to learning our favorite sports teams are losing or have lost a game. These are also common responses homeowners have to seeing a water stain on their ceiling. Stay with me. It may not be as bad as you think. A simple fix might alleviate your frustration. 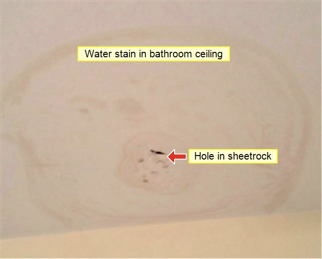 During a recent home inspection, I found a water stain in the master bathroom ceiling. Moisture levels were elevated at the time of inspection and there was water penetrating from the roof. The sheetrock was deteriorated to the point that a hole developed near the center of the stain (see picture below). The water stain. Cue deep sigh of frustration. The roof shingles were less than a year old so the home owner thought that this was a previous water leak from the old roof. I inspected the attic and didn’t see signs of water damage on the wood framing or sheathing so my next stop was the roof itself. I knew that the roof shingles were new. What I found was that the plumbing boot above the bathroom and around the plumbing vent pipe was cracked in several areas (see picture below). You had one job! One! If the rubber plumbing boot does not seal completely around the vent pipe, water can penetrate. This will cause water to drip down the outer edge of the pipe and then inside the home. This was the case in my inspection. There are many ways to repair this. Since this was a new roof, the home owner called the roofing company and they replaced the defective plumbing boot by removing the old one, along with a few shingles and installed a new boot. If your roof is not covered under a warranty, and you are not familiar with installing roof shingles there are two ways you can do it yourself. 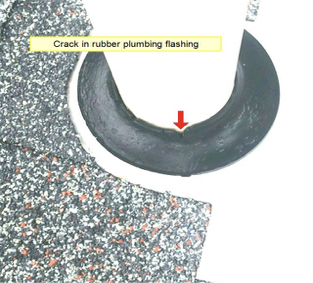 First, you can apply a thin coat of roofing cement around the cracks of the rubber boot thereby creating a water tight seal. Roofing cement comes in both cans and tubes. I recommend using caulk tubes as it is easier to apply. The roofing cement dries out over time, so you will need to re-inspect and re-apply it to ensure that the water seal remains intact. Second, you can install a Perma-Boot over the existing plumbing boot. 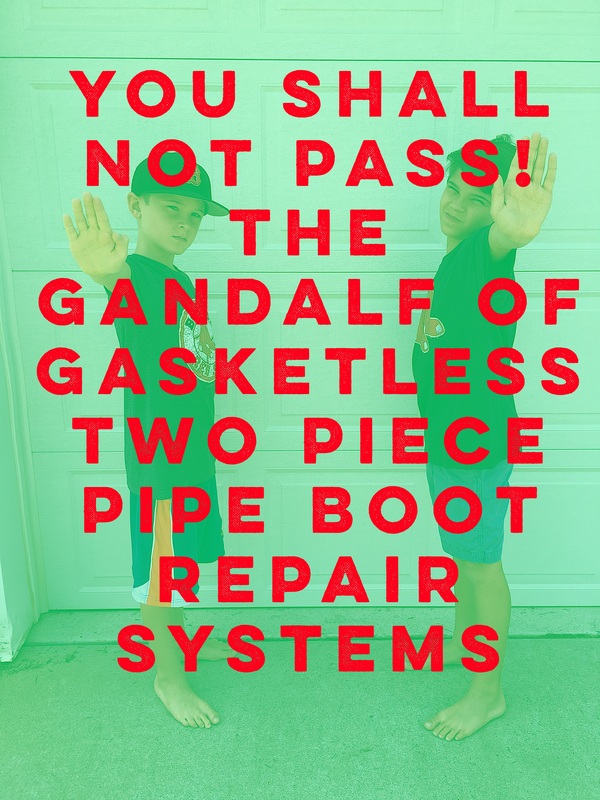 A Perma-Boot is a gasket-less two piece pipe boot repair system. It’s designed to permanently repair the most common type of roof leak. Mainly, leaks around the vent pipes that penetrate your roof. Remember when Gandalf stopped the Balrog from crossing a bridge in the movie The Lord of the Rings? He shouted, “you shall not pass!” That’s what a Perma-Boot does. It says, “water, you shall not pass!” It stops leaks. Also, the Perma-Boot is a brand name and can be purchased at hardware stores, lumber yards, The Home Depot and Lowe’s. The manufacturer warranties the Perm-Boot for the life of the roof shingles and it comes with installation instructions. Thirdly, you can install a new plumbing boot. This was the case for this inspection. It was a new roof and the home owner called the roofing company. 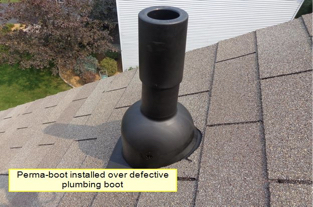 Since the roof was still under warranty, they replaced the defective plumbing boot by removing the old one, along with a few shingles and installed a new boot. Putting in a new Perma-Boot is easy to do. It comes in two pieces, the lower larger portion slips over the existing plumbing vent and you push it down until it comes in contact with the roof surface. They recommend applying a thin layer of urethane adhesive around the top portion of the boot where it intersects with the vent pipe and then installing the top cap. It’s that easy. I installed two Perma-Boots on my home 7 years ago and they are both doing their job of keeping water out of the home. What looks like a rubber telescope looking up into the sky is actually a Perma-Boot doing what it does best- stopping leaks! The cracked plumbing boot was an unusual scenario. The homeowner just had the roof and flashings replaced less than a year ago. The plumbing boot was brand new and defective. As a result, the pluming boot and ceiling in the bathroom needed to be repaired. Fortunately for the homeowner, the leak was detected and the roofing company covered both repairs. As a home owner, I recommend inspecting your attic periodically for roof leaks. 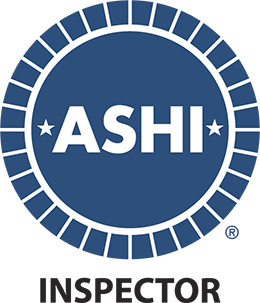 You will be able to see signs of water penetration by looking for water stains on the wood framing and sheathing. If you inspect it during a rain storm, examine and feel the plumbing vents for signs of moisture intrusion. Catching a roof leak early can reduce repair costs and make a happy home.